"American elm close to East College Street" by L. Michael Hill Ph.D. The campus had one American elm Ulmus americana (Ulmaceae) close to East College street across from the Balsam fir in front of Nininger. 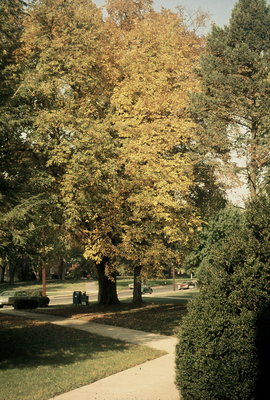 Forest service personal found the dutch elm disease and the tree had to be removed, about 1976.